The Blinn Board of Trustees will consider the sale of $30 million in debt issuance to fund a new science and engineering building on the Brenham campus. The board will consider bids received on the debt issuance. 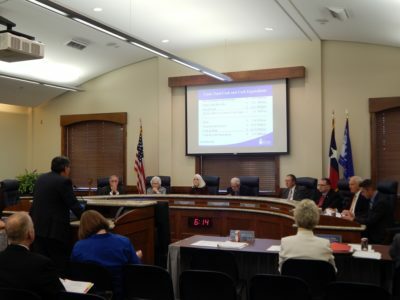 In January, trustees authorized the College to seek qualifications for architect services related to the new building. Funds from the sale will be used for the design and construction of a new Science, Technology, Engineering, and Innovation Building, including classrooms, laboratories, and administrative facilities. Trustees are recommending awarding the construction contract to PBK Architects. The debt issuance will be paid over the next 25 years. Depending on the interest rate Blinn receives, annual debt payments should come out to around $1.9 million. Consider awarding a contract to Madison Construction for site improvements on the Brenham campus. Consider a contract with SKG for furniture, as part of the W.L. Moody Jr. Library renovations on the Brenham campus. Look at a contract with Marek Brothers Construction for parking, grading, and drainage improvements at the RELLIS Campus in Bryan. Consider awarding a contract with Conlee-Garret Moving and Storage for moving services related to the Health Science Division’s relocation. The board will meet Tuesday afternoon at 5 p.m., in the Brenham Campus Administration Building.